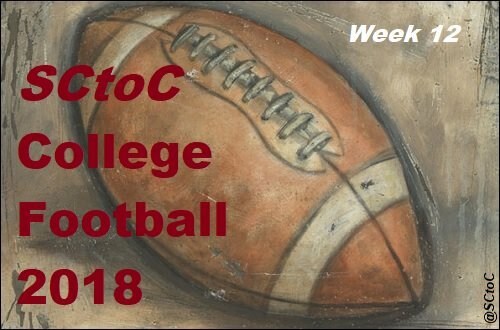 Welcome to SCtoC's week 12 coverage of the 2018 College Football Season. What: The Broncos head south to Mexico to battle the Lobos. When: Friday, November 16 at 6 p.m.
Where: Dreamstyle Stadium; Albuquerque, New Mexico. 2018 Records: Broncos 8-2 (5-1 Mountain West); Lobos 3-7 (1-5 Mountain West). Head Coaches (overall as HC): Broncos - Bryan Harsin (57-18); Lobos - Bob Davie (68-77). 2017: The Broncos defeated the Lobos, 28-14, at Boise. Broncos Notes: The Broncos are hoping to represent the Mountain West's Mountain Division in the conference championship game. Last week's 24-17 win over Fresno St. aided in that goal, but they still stand a game behind Utah St. in the standings. Wins over this New Mexico team and Utah St. in the regular season finale should propel them to that title game. Brett Rypien was solid in the win over Fresno St., completing 83 percent of his passes for 269 yards with a touchdown and an interception. Alexander Mattison, who has been an outstanding rusher this season, amassed 144 yards on 30 carries with two trips to the end zone. Veteran receivers A.J. Richardson and Sean Modster each had five catches, for 66 and 63 yards, respectively, while Khalil Shakir added four grabs for 59 yards and a score. Lobos Notes: The Lobos have had a rough season, but could emerge with a somewhat respectable 2018 with a win over the Broncos and another win over Wyoming in week 13. Both will be tall orders. However, both are in Albuquerque, so both could be interesting. The Lobos fell to Air Force last week, 42-24 (the Broncos topped Air Force, 48-38, in week 9). Sheriron Jones and Coltin Gerhart split time under center against the Falcons, combining to go 13 of 18 for 186 yards and an interception. Gerhart is the youngest brother of 2009 Heisman Trophy runner up Toby Gerhart, who played for Stanford. Daevon Vigilant gained 67 yards on a dozen carries in the loss. Delane Hart-Johnson and Anselem Umeh each caught three passes, for 83 and 77 yards, respectively. What: The Eagles visit their Northwest rival Vikings in the regular season finale for both teams. When: Friday, November 16 at 7:05 p.m.
Where: Roos Field; Cheney, Washington. 2018 Records: Eagles 8-2 (6-1 Big Sky); Vikings 4-6 (3-4 Big Sky). Head Coaches (overall as HC): Eagles - Aaron Best (13-6); Vikings - Bruce Barnum (17-27). 2017: The Eagles defeated the Vikings, 59-33, at Cheney. Eagles Notes: The Eagles are in good position to win at least a share of the Big Sky title. Due to their dominating 59-20 win over UC Davis last week, they hold the tiebreaker over the Aggies. Their loss to Weber St. two weeks ago could complicate things if all three end up in a first-place tie at 7-2. As there is no conference championship game, there could be three co-champions. Eric Barriere hit 16 of 30 passes for 285 yards and a touchdown against the Aggies. It was the running game, however, which put the Eagles over the top. Antione Custer, Jr., Sam Macpherson and Tamarick Pierce rushed for 104, 99 and 75 yards, respectively. Each of the three scored two rushing touchdowns. Steady Nsimba Webster added three receptions for 103 yards to the cause. Vikings Notes: The Vikings have no post-season hopes heading into the season finale, but they can definitely play spoiler against their rivals to the northeast. The Vikings were 0-11 last season, but have put together the beginning steps of their rebuild. Call it Barney Ball 2.0. The Vikings are looking to make some noise in the seasons to some. Their signature win this season came on a 52-yard field goal by a freshman kicker as time expired against Montana. A win in this one could replace that. Davis Alexander has been strong, even in the Vikings' 17-10 week 11 loss to North Dakota. He threw for 139 yards, while rushing for 70 yards and a score. Darian Green is the compliment in the backfield, having gained 48 yards on 11 yards. Tight end Charlie Taumoepeau could be a player to watch in this game. He leads the Vikings this season in receiving yards with 502 and touchdowns with five. What: The Ducks are at home for the final time this season as they welcome the Sun Devils. When: Saturday, November 17 at 7:30 p.m.
2018 Records: Sun Devils 6-3 (4-3 Pac-12 South); Ducks 6-4 (3-4 Pac-12 North). Head Coaches (overall as HC): Sun Devils - Herm Edwards (6-4); Ducks - Mario Cristobal (31-52). 2017: The Ducks defeated the Utes, 41-20, at Eugene. Sun Devils Notes: The Sun Devils are one of two Pac-12 South teams who are bowl eligible (Utah is the other). ASU has their sights set on the Division title which would earn them the opportunity to play in the Pac-12 Championship Game in Santa Clara They are just a half game back of Utah with two more conference games to play. This is Herm Edwards' first college head coaching job after having earning a 54-74 record as top man for eight seasons in the NFL with the New York Jets and Kansas City. Eno Benjamin rushed for 182 yards and scored once in the Sun Devils' 31-28 win over UCLA last week. Manny Wilkins completed 16 of 22 passes for 199 yards with a touchdown and an interception, while rushing 14 times for 60 yards and a pair of touchdowns. N'Keal Harry added Seven catches for 100 yards in the win. Ducks Notes: This is the regular season home finale for the Ducks, who have a chance to go 9-4 on the season should they win their final two games and their bowl game. The Ducks are one of five Pac-12 North Division teams who are headed to a bowl game. Just one, however (Washington St.), still has a chance to make it to the college football playoff. The Ducks have dropped three of their last four after starting the season 5-1. The most recent was a 32-25 loss at Utah. Justin Herbert went 20 of 33 for 288 yards and three touchdowns. One of the conference's most prolific receivers, Dillon Mitchell, had fight grabs for 169 yards and a pair of touchdowns. Freshman running back Travis Dye gained 66 yards of of nine carries and should see some action in this one. C.J. Verdell added 11 rushed for 28 yards and three receptions for 64 yards for the Ducks. The following week 12 matchup has been postponed from its original date on Nov. 17 to Dec. 1 due to poor air quality as a result of several wildfires in central and northern California. The times and other details will be updated as more details become available. What: It's time for The Big Game as the Cardinal visit the Golden Bears. When: Saturday, November 17 at 4:30 p.m.
2018 Records: Cardinal 6-4 (4-2 Pac-12 North); Golden Bears 6-4 (3-4 Pac-12 North). Head Coaches (overall as HC): Cardinal - David Shaw (79-26); Golden Bears - Justin Wilcox (11-11). 2017: The Cardinal defeated the Golden Bear, 17-14, at Palo Alto. Cardinal Notes: Stanford is bowl bound for the 10th straight year, and have made it to the post-season in each of David Shaw's eight years as head coach. The Cardinal are hobbled, especially on defense. While traditionally a run-oriented team, the Cardinal have relied heavily on the arm of their quarterback, K.J. Costello this season. In the Cardinal's 48-17 win over Oregon St. last week, Costello completed 23 of 33 passes for 342 yards and four touchdowns with an interception. Tight End Colby Parkinson was outstanding, catching all of his school-tying four touchdowns in the first half en route to his six catches for 166 yards against the Beavers. Trenton Irwin hauled in sic passes for 70 yards. Bryce Love had his best game in nearly two months, rushing 11 times for 90 yards and a touchdown. Golden Bears Notes: The Golden Bears are going bowling for the first time since 2015 after stunning USC at Los Angeles last week. Their defense has shone all season long and will provide a formidable challenge for the Cardinal offense. Cal is an emerging squad in the Pac-12, having recorded not only the win over the Trojans, but a 12-10 over Washington. Winning the Stanford Axe over the Cardinal would provide for the hat trick. The Axe is presented to the winner in this annual rivalry game between the teams. Chase Garbers went 21 of 34 for 180 yards with two touchdowns and a pick. Patrick Laird, who still has a shot at a 1,000-yard rushing season, rushed 19 yards for 71 yards, and Vic Wharton III added two receptions for 34 yards and a touchdown against USC. Cal is .500 since Justin Wilcox took over as head coach prior to last season. It should be noted that there is strong interest in postponing the Stanford-Cal game due to air quality issues caused by the wildfires in northern California. One of the school's basketball games has already been canceled for this reason. One possibility is to move the The Big Game to the weekend of the Pac-12 Championship Game since neither team will be representing the North Division in that game. We'll keep our readers aware of this as it develops. Broncos Lobos starts now. Scoring updates forthcoming. Touchdown Broncos. Sean Modster 15 yard pass from Brett Rypien. Haden Hoggarth kick. Touchdown Broncos. Sean Modster 16 yard pass from Brett Rypien. Haden Hoggarth kick. Touchdown Lobos. Daevon Vigilant 1 yard run. Andrew Shelley kick. Touchdown Eagles. Eric Barriere 66 yard run. Andre Slyler kick. Touchdown Broncos. Desmond Williams 9 yard fumble return. Haden Hoggarth kick. Touchdown Eagles. Jayce Gilder 1 yard pass from Eric Barriere. Andre Slyler kick. FG Broncos. Haden Hoggarth 34 yards. Touchdown Vikings. Davis Alexander 3 yard run. Cody Williams kick.